You might think that living in a gated community with luxury amenities near the world-renowned playground of Daytona Beach, Florida, is financially out of reach. Don’t rule it out, though, until you’ve seen what we have to offer at Bear Creek, a gated community of manufactured homes for residents 55 and older. It’s owned and operated by Blair Group, an award-winning developer of communities founded on the concept that well-maintained manufactured homes can offer all the comfort of traditional site-built houses for a lower price. 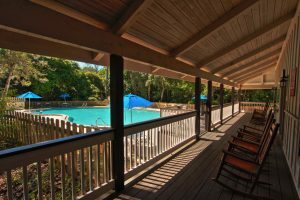 That’s how our gated community allows you to devote more resources to achieving the active Florida lifestyle you want in your golden years. Rustic lodge: This is the primary gathering place of our gated community, featuring a large stone fireplace surrounded by couches, a covered porch with rocking chairs, and fully equipped kitchen. Outside are a large pool and wooded nature trails. Entertainment hub: In this clubhouse, the banquet hall has a performance stage and dance floor. There’s also a fully equipped kitchen, tiki bar, gift shop, and game rooms. Outside, there’s a semi-covered pool with hot tub, plus horseshoe pits and lighted courts for pickleball, tennis, and shuffleboard. Exercise central: A fitness center, an aerobics room, an outdoor lap pool, and bocce ball courts make this clubhouse the ideal attraction for those who want to stay in shape. There’s also a hot tub for relaxing after the workout. In addition, if that’s not enough to keep you busy inside our gated community, you’ll find an exciting 18-hole golf course that’s open to the public and accessible by golf cart, plus Tomoka State Park, with a nature trail, canoe launch, and history exhibit, only minutes away. Beyond that, there are all the fine dining, shopping, and seasonal events that this area is known for to explore. So don’t wait! Discover all the reasons Bear Creek is more than just a place to live … it’s a lifestyle. Contact us today to schedule a tour of our exquisite gated community near Daytona Beach, FL.